I know! I haven't updated this blog in forever! I am ashamed :( I've been so busy and so tired, real life just doesn't like me lately, not to mention the light has been crappy even when I did have a chance to use my camera to take photos. Bleh. I should have Spa Ritual Howl polish up this weekend and a True Blood Vampire Lip tutorial soonish. Until then however, here is a review on Scarecrow's Small Deluxe Custom Fangs. Scarecrow's custom fangs are perfect if you want to look like an authentic vampire. 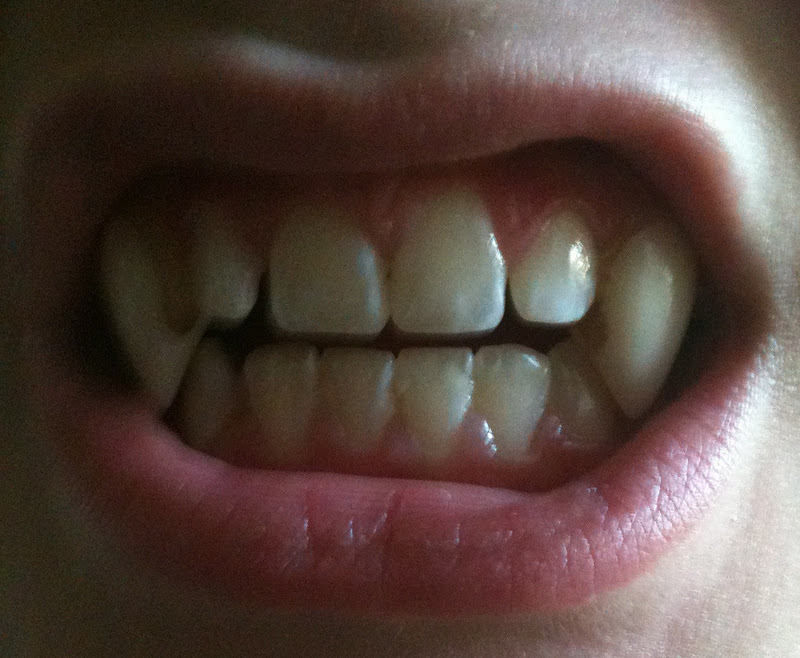 These are the small or subtle fangs as I'm quite small myself but there are all sizes and shapes. You can order them either directly from the Scarecrow main website here, or at Vamp Fangs' website here (but they're more expensive). I'm fairly sure (I've had these for a couple years) that I got mine from the Scarecrow website and they're still the same price I got them then, $14.95. They were also my first online purchase order- oh what a scary road that has lead to since then! Hehe. 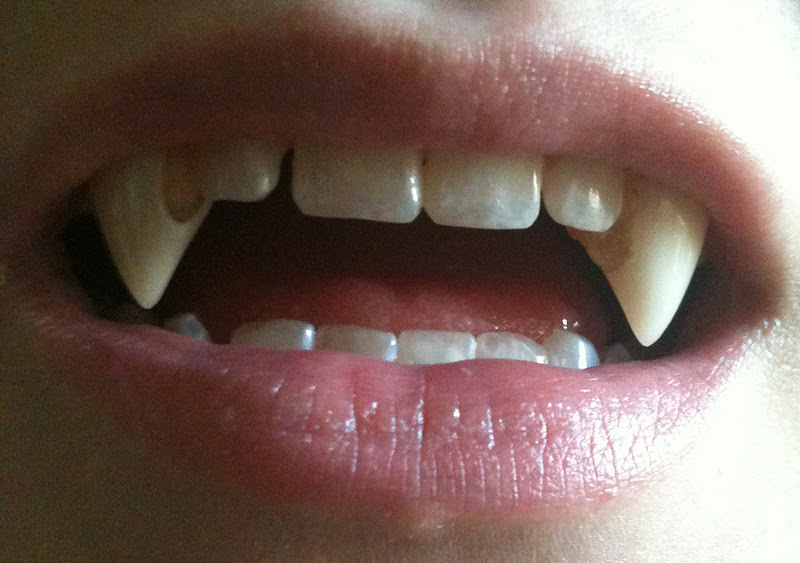 The idea behind these fangs is they slide over your teeth and look realistic. This is done via a custom fitting dental mix (dentist approved!) that will NOT damage your teeth (I swear they won't there is no way I would have risked my teeth for this). It's not a glue. The mix is a powder and liquid that you mix together with a toothpick. Once fully mixed you scrape a fairly large glob into the back of the fang and then in front of a mirror squish it into a position that you think looks nice. Don't press too hard, you want it to form a mold of your tooth. It's okay if the mix oozes out from around the edges of the fang, you'll fix that later. Then you get to have the fun of laying down with your mouth open for about 15 minutes. Whoot what a blast. Try not to touch or disturb the fang otherwise you won't get a good fit. When it's solid you're going to gently press inward on the tip of the fang. You'll hear a click sound and the fang will come loose. You'll see something like this on the inside. Lightly lick the inside of the tooth mold and ease over your tooth. Gross I know but you'll need the liquid to kinda vacuum seal your fang to your tooth. Then do the same with the second fang. Once both fangs are done you're going to take some nail clippers and carefully clip away the excess/oozed over mix from the fang, this will make the fangs look more realistic. Then tah-dah! Instant vampire! I does take a little getting used to but they're fairly comfortable to wear for an extended period of time and in my opinion they look awesome. Plus they're reusable, I'd just recommend sanitizing them every once in a while (i.e. take a little cup and swirl them around in some mouth wash, then rinse with water). Overall, they're a good, inexpensive way to dress up. The kids last Halloween that came to my door had such huge eyes when they saw them! Sprite Rating: 9/10, they only lost one point because the clipping of the excess around the edges is difficult and fiddly. Plus the coffin-case they come in doesn't close well. However they do give you a little extra mix so if you screw-up once it's not the end of the world. Would I buy these again? Yes. The site I got them from was fairly priced, and they shipped fairly quick. Plus they had a video explanation on how to apply the fangs.